It is only known by few, however, that the end of the day is the prime time to make savings for your business and the best bit is, it doesn’t take much effort and incurs no expense. How can I make end of the day savings? At the end of each day, make the effort the concentrate on the little things that make your business function and how to reduce the amount they’re costing you. You can do this by following our simple end of the day savings checklist, or – since you’re the boss around these parts – you can delegate the task to a trusty co-worker. Make this a routine and the savings will soon start piling up! 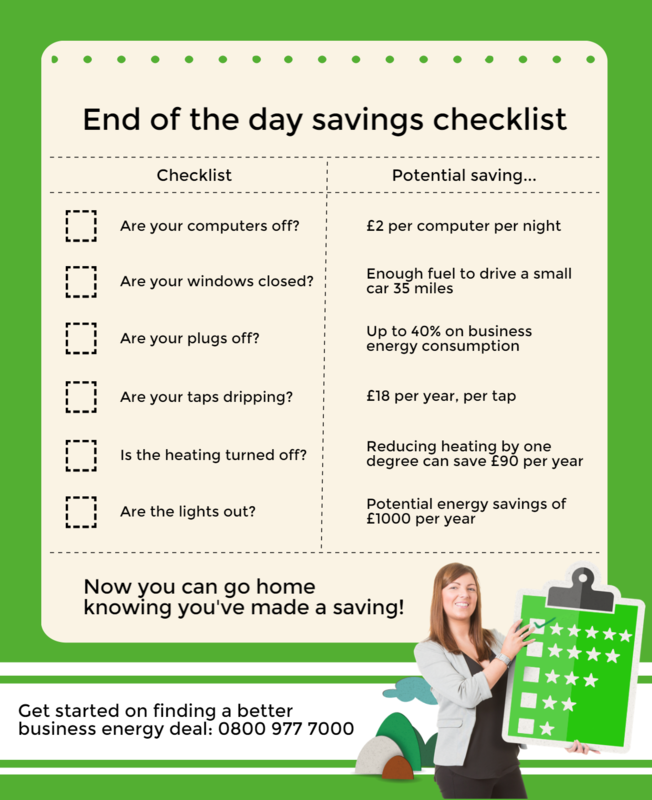 Another great way to make easy savings for your business is to be sure that you’re on the right tariff. Being on the wrong tariff, or being out of contract, could result in you overpaying your business energy and utility suppliers by thousands each year. If you think your business energy bills are too high, call us on 0800 9777 000 to see how we could help you save. Completing the above checklist can help your business to work toward becoming more environmentally friendly and reduce business energy overheads. We believe a comprehensive energy plan, that helps you to lower your business energy consumption alongside handling contract arrangements is the perfect concoction to assist UK businesses in striving towards climate change targets. By joining Exchange Utility, you can be confident that your businesses needs are taken care of and can utilise our buyer power to get a better deal on your gas and electricity. It’s quick and easy to get a business energy quote to see if your business can save money on your Gas and Electricity. Call us today on 0800 9777 000 to learn more.